The Tuolumne County Historical Society gives us this excellent history of Pickering in Tuolumne County. Some of the original Bradford mill buildings in Sonora can still be seen on Washington Street where JS West uses them for part of its operations. They contain a history and description of the buildings that were at Standard, done for the purpose of determining if the site was suitable for inclusion in the National Registry of Historic Places, or designation as an historic site. These were given to us by Judith Marvin, one of the authors of the reports. 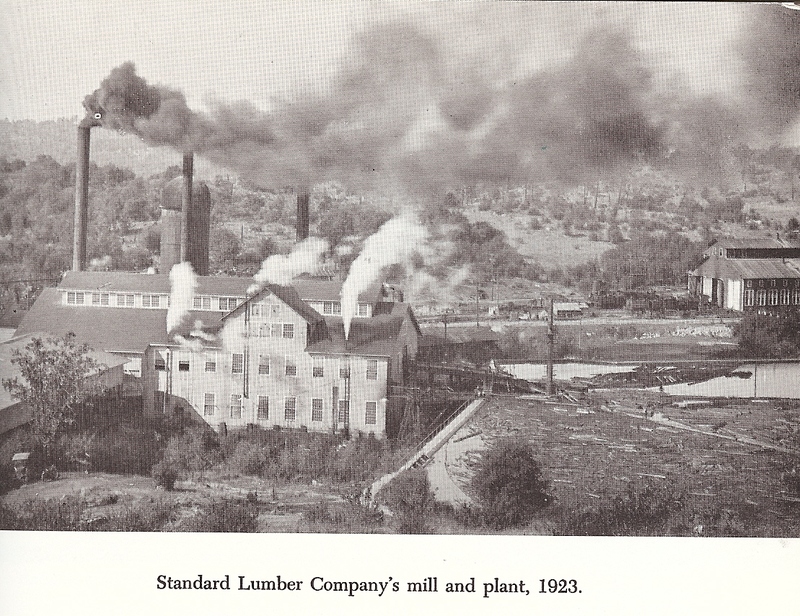 What was the Pickering Mill at Standard is now owned and operated by Sierra Pacific Industries, the lumbering giant. The mill was closed in 2009, but reopened with modernized equipment in 2011. Gerald French, author of the definitive book, When Steam was King has given the Sierra Nevada Logging Museum a collection of his slides of the Pickering Lumbering operation in 1958. We will soon have a display of his photos in the museum. Brian Wise owner of the Yahoo Group of plcorp, a group of people especially interested in the history of the Pickering Lumber Company, gives us this history of how the Calaveras Big Trees, South Grove, was saved from the lumberman’s axe. “Actually, the push to save the Big Trees goes way back to 1900 and earlier. After their “discovery” in 1852, various persons were quick to exploit the trees. At least one mammoth sequoia was cut down, and another had its bark stripped for display overseas. The South Grove property was sold at public auction (by the State of CA) for $15,000 to a Mr. Sperry, who later sold it (1900) to a lumberman named Whiteside. It was that sale that aroused public awareness of the Big Trees and inspired the creation of the Calaveras Grove Association. The CGA assisted in the movement to create a system of state parks, which occured in 1928. In 1931 the North Grove finally became a state park, but the South Grove property had already been sold to Pickering in 1927. When the Great Depression hit, private donations became scarce, state park funds all but vanished, and the CGA disbanded so there was no push to acquire the South Grove and add it to the park system. My grandmother, Gurtrude Pickering was pregnant although unmarried and wished to marry her cousin Thomas Pickering who was sent away to America in disgrace in 1905/6 to ‘family’ (cousins/uncles?) to work on a ranch/farm or in the lumber company? A contact was made in the 1940s to our family regarding a ranch and again in the 1970s my mother received a ‘phone call from the USA asking after my father, my mother dismissed this as my father died in 1962. I have been tracing the records back and it would appear that Alfred who founded the Timber Company may have been the elder brother of Edward who was the father of my Great Grandmother Alice Pickering who is shewn as single head of household with her daughter Gurtrude and her son, my father, in 1911. There are clear Derbyshire connections also Leicestershire and Nottingham all very local to each other in England. I have a lot more detail if required. Interesting, Lesley. Thanks for the history. No, I have no contacts for you. Sorry.